Banking on the technical expertise of our skilled professionals, we manufacture and supply a wide range of Dummies. Our products are available in various sizes and shapes that are made using high grade material. These products are available in the market at industry leading prices. 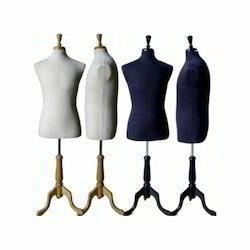 These Hanging Half Dummies create an alluring effect on the clients and prompt them to purchase. These Dummies are also light in weight and have been intricately carved to provide them exact feel of a human hand. These can be customized in terms of size and posture as per the specific requirement of our customers. Backed by the profound experience of the market, we have been able to provide Full Length Dummies. 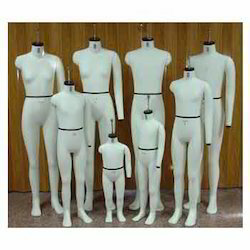 These dummies are suitable to display different dresses of men, women and children. There are numerous options available in our gamut of dummies. These dummies are manufactured at our well-equipped production unit utilizing superior quality raw materials and the latest methodology under the guidance of our skilled experts. 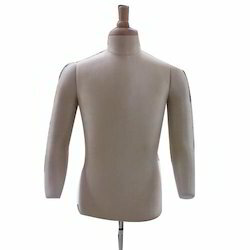 By keeping track with the current market developments, we are engaged in offering wide variety of Half Body Dummy. These are designed and constructed by our professionals using supreme class raw material in compliance with international quality standards. Our offered range is appreciated for its superior quality, light weight and durability. 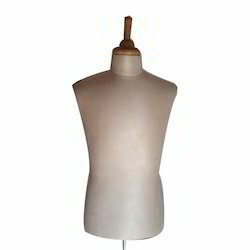 We offer a high quality of Hanging Half Body Dummy that are designed by our qualified and trained designers.Our range of Dummies are durable and stylish which are used for showcasing ready made garments. These are designed with acute precision and special emphasis is laid on the detailing of the designs. Looking for Half and Full Dummies ?